The first trailer for Hellboy dropped a day early, so watch it here. Lookin' awfully like Hellboy, Harbour. Hellboy is returning to theaters, and this time he's coming without Guillermo del Toro. The long-running comic series has already had two film adaptations: 2004's Hellboy and 2008's Hellboy II: The Golden Army. But as any diehard fan knows, director Guillermo del Toro's interpretation of the Hellboy universe in those films was much more warm and colorful than the comics they were based on. Though Hellboy actor Ron Perlman was built for the role and the films were met by a solid critical response, something felt... off. But now, Hellboy's creator, writer and artist Mike Mignola, has approved a reboot helmed by director Neil Marshall, one that Mignola promises will be a darker and more accurate reflection of the often-bleak Hellboy comics. And as you can see above, actor David Harbour is already looking the part in the first tease of Hellboy's latest iteration. Check out what we know about the latest effort to put everyone's favorite son of Azzael back in theaters, as well as details on a Hellboy-themed celebration coming to a comic book shop near you next year. You can check out the details on the trailer here, or watch it below. The first trailer, which is very similar to the footage screened for fans at New York Comic-Con earlier in the ear, strikes a more humorous tone than fans might expect given the darker tone promised for the film. But there are glimpses at some familiar otherworldly terror and violence interspersed between the quips. Earlier in the week, Hellboy star David Harbour dropped a new mini teaser. And the official Hellboy account gave us even a different teaser ahead of the trailer reveal, and a new poster arrived on IGN. In an interview with CNET Magazine, Harbour doubled down on the idea that we can expect a darker, grittier Hellboy than del Toro's adaptations, and that he's bringing a bit of Hamlet to 2019's version. "When I compared it to Hamlet, I was saying it's a mature movie with adult themes," Harbour said. "He's an adult struggling with adult things. It's not like whether or not I should kill the bad guy by punching him. It's more like, Who's the bad guy?" He went on to explain that the R rating isn't just about swearing and violence, but "a bit gory, a little bit horror film-y." Now playing: Watch this: Hopper? Hellboy? Harbour? Harbour's perspective was echoed in a recent interview with Marshall, which coincided with the release of the first official photo from the film. "It was always a case of, 'When in doubt, go back to the source material.' Some of the stuff is pretty sick. More violent and more bloody. We weren't making it with handcuffs on," Marshall told Empire. Hellboy began production in September 2017 and wrapped filming at the end of December 2017. The film was originally slated for a Jan. 11 release. But as no trailer emerged, a delay became evident. Hellboy will now be released in theaters on April 12, 2019. Beyond early shots of Harbour in his Hellboy makeup and promotional posters at the Cannes Film Festival, there wasn't much to go on until New York Comic-Con, at which an exclusive trailer was screened for fans that eventually leaked (in predictably low quality) across the internet. The trailer is more action-paced and quip-centric than one would expect from much of the discussion about Hellboy so far. The tagline is "Save the World For the Hell of It." But a trailer's just a trailer, and Harbour's makeup and some glimpses of the more outlandish elements of the Hellboy world look promising. Lookin' pretty metal there, Hellboy. Cast: Who's with Hellboy, and who's against him? 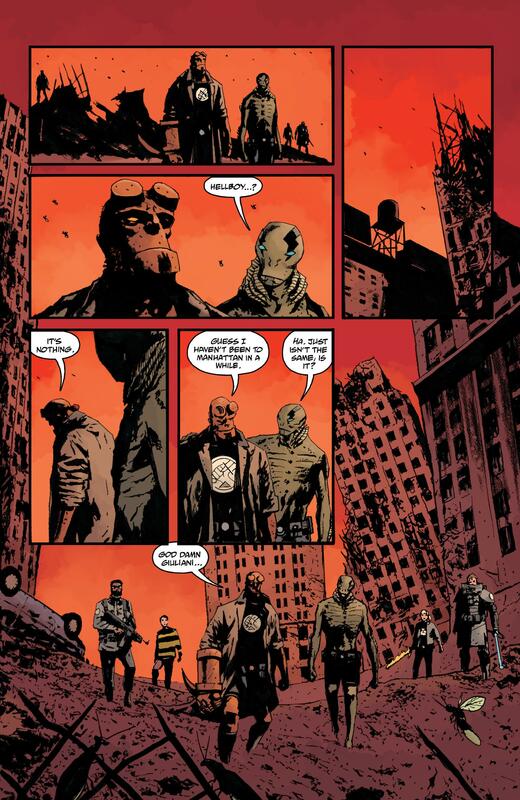 Hellboy cast members Elizabeth Sherman and Abe Sapien, who both featured prominently in the del Toro Hellboy films and have led the ongoing Bureau for Paranormal Research and Defense comic without Hellboy, are so far noticeably absent, suggesting the film will feature less of the government agency's goings-on and be a more self-contained story like many of the Hellboy comics. If you're looking for a more in-depth breakdown of Hellboy's characters, check out this guide from Gamespot. So far, very little is known about Hellboy beyond the basics of its cast and tone. What's very clear is that this Hellboy is going to try to separate itself from the glut of superhero comic adaptations in recent years, and double down on what's made the comics unique. "Basically, there's no part of Hellboy that was ever going to be like other superhero movies. And the more Marvel stuff there is, the more DC stuff there is, Hellboy never really feels like -- even in the [Guillermo] del Toro things -- a superhero movie," Mignola said in an interview with io9. "It's so much 'big teams of guys, in costumes, running around and saving the world from big cosmic menace stuff...' I believe the new movie will feel even less like a regular superhero thing." 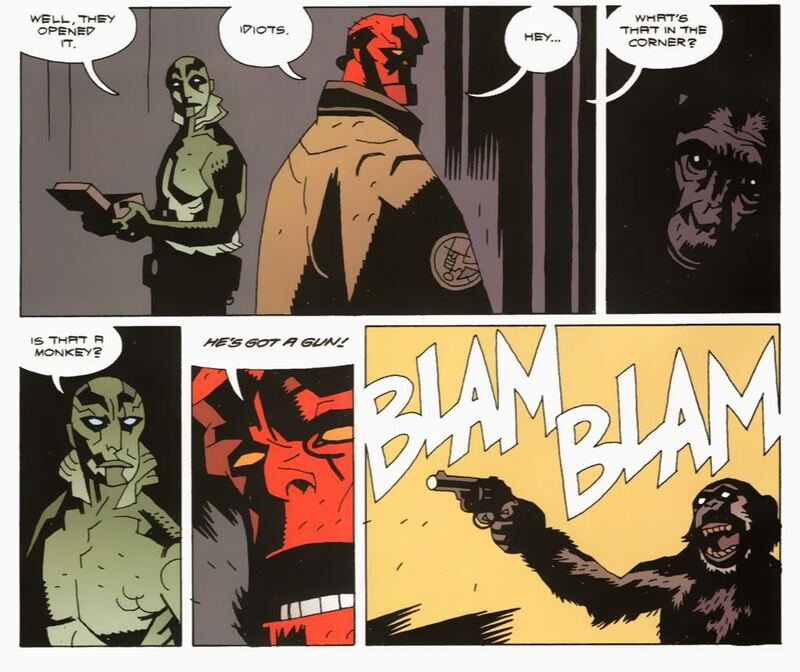 A big part of what differentiates the Hellboy comics is their close tie to regional folklore (what other series has Baba Yaga as a recurring villain? 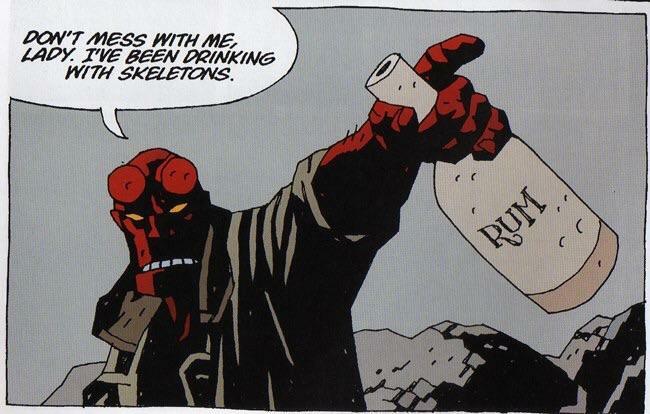 ), a measured, serious tone (when Hellboy's not drinking with skeletons or fighting armed monkeys) and a broad scope (just look at the state of the Earth in the current comics). "To me, it's very Shakespearean. I grew up doing regional Shakespeare and when Hamlet sees the ghost of his father, there's something about that that you don't really do in film anymore," Harbour said in an interview with Collider. "We rarely see an indie film where you have an emotional pathos where somebody sees a ghost. This is a palette where you can have demons and ghosts and big creatures and things that are epic, in that way." Though neither comics have been mentioned as inspiration for Hellboy, given the announced cast and the film's original subtitle "Rise of the Blood Queen," it's likely elements from the Hellboy: The Wild Hunt limited series and Hellboy: The Storm & The Fury collection will feature prominently. Nimue the Blood Queen and Monaghan both play prominent roles in those two storylines. What's up with Hellboy Day? Next year also marks the 25th anniversary of Hellboy's first appearance in Dark Horse's Hellboy: Seed of Destruction. To celebrate the anniversary, Dark Horse is encouraging comics retailers to celebrate Hellboy Day on March 23, 2019. Participating shops will hand out free copies of Hellboy: Seed of Destruction's first issue, complete with a new cover from Mignola, along with other swag for Hellboy fans. Hellboy's David Harbour keeps it real: Where Harbour talks more about the paranormal detective.